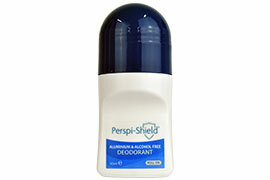 Perspi-Shield® is a range of specialist antiperspirants and deodorants focussing on alternative methods of protection from wetness and odour. Products in the range include Perspi-Shield Aluminium Free Deodorant Roll-on, Perspi-Shield Aluminium and Alcohol Free Deodorant Roll-on, Perspi-Shield Underarm Sweat Liners, and Perspi-Shield Sweat Proof Undershirts. 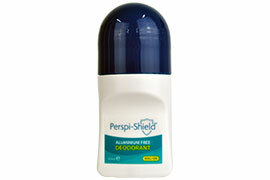 Perspi-Shield® products are available to order from The Antiperspirant and Deodorant Company and other leading retailers. 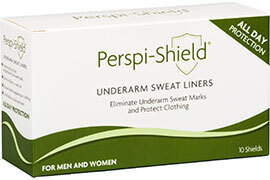 A convenient, modern remake of the traditional dress shield, Perspi-Shield® Underarm Sweat Liners stop sweat stains appearing on the underarm area of clothing. 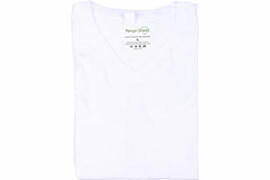 High quality, extremely absorbent “tailored-fit” undershirt with reinforced underarm sweat protection.